I find it easier to use a mouse with my laptop rather than use the trackpad. I’ve tried a few different mice over the years with varying degrees of success. I was excited to try the NX-ECO Battery-Free Wireless Notebook Mouse, mostly because I wouldn’t have to worry about having spare batteries on hand. Was my excitement justified? Read on. The NX-ECO Battery-Free Wireless Notebook Mouse (The Mouse for short) uses a built-in gold capacitor with a long life of 100,000 recharges. It can be used with either hand, and works with Macs or Windows computers. 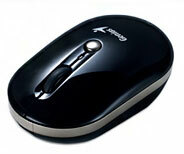 The Mouse charges very quickly; in less than five minutes you’re up and running. The micro USB cable and USB Pico receiver fit inside The Mouse, making them less likely to get lost or caught up in a bag of cables. For extra convenience, Genius includes a Stick-N-Go mount to easily attach The Mouse to your laptop case. Genius claims The Mouse works on any surface, and in my testing their claims are true. I used The Mouse on a wooden table, a tablecloth, a carpet, a mousepad, and on the computer itself. I even used The Mouse a few times on my leg. Each time The Mouse worked as promised. The lifespan of each charge isn’t very long. I found when I used The Mouse for a long period of time, such as when I was editing my podcast, 3 Geeky Ladies, I had to recharge The Mouse numerous times. Consistent use only gave me about three hours. While it only takes a few minutes to recharge The Mouse, it’s annoying to have to stop, plug in the cable, use the trackpad while recharging, remove cable, and then start using The Mouse again. Also, be sure The Mouse is completely charged before using. I noticed occasionally the pointer would move all over the screen and be a bit out of control. Plugging it back in to fully charge solved that problem.